It is a well-known fact that there was once a tennis court behind the Bay Roberts cable station. This court was built and maintained by the Western Union in order to provide some leisure and entertainment to their staff. 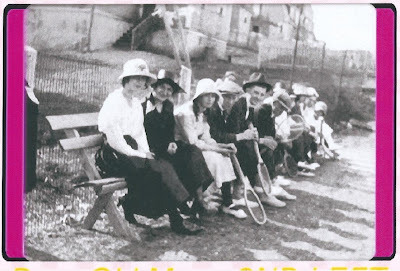 Below are two photographs of people waiting to play tennis, and each came to us from different sources. When we put them together, it was a surprise for us to see that they were almost identical, but not quite -- you can see that one was taken just after the other. It's likely that they had the same photographer, believed to be Mr. Robert Mercer, former cable employee and avenue resident. We wonder how the two photographs got separated but are happy to reunite them. Can you spot the differences? And which do you think was taken first? Photograph provided by V. Williams (London, Ontario), whose husband Brian was raised on Cable Avenue. 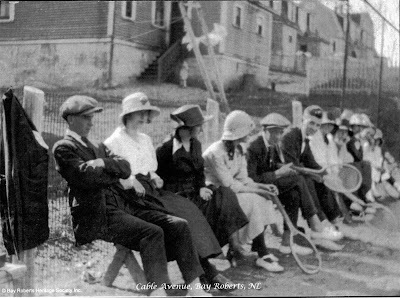 Photograph provided by the Bay Roberts Historical Society Inc., part of their larger cable-related collection. If you know anything about these photographs, like the names of people in the tennis line, or if there are any more images in the series, I'd love to hear from you: lisa@heritagefoundation.ca.